Anyone who participates in fitness feels a special kinship with those runners who were nearing the finish line. Bodybuilding.com extends its sympathies to the people affected by the tragedy in Boston on April 15. Anyone who participates in fitness of any kind, at any level, feels a special kinship with the runners who were nearing the finish line when two bomb blasts killed three people and injured at least 170 others. The victims included many who were in attendance simply to cheer on a friend or loved one. 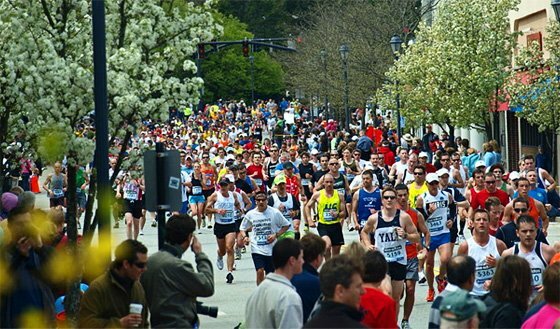 Marathons are among the most demanding sporting events, but they're also one of the most democratic. Virtually anyone with enough grit and preparation can work their way up to completing one. The same impulse prompts others among us to lift weights, participate in team sports, or otherwise dedicate our precious time to physical training. Whether we lift iron or pound the pavement, we seek to stretch our limits, and in the process, redefine ourselves. For an act of violence to end lives near the finish of such a life-transforming event is particularly heinous. In the coming days, the victims and their loved ones will begin the long journey of rebuilding their lives. Our hope for these men, women, and children is that the strength of body and spirit borne of their training will, where possible, make their burdens a little easier to bear. In the meantime, let's all stand ready to help. If you have information about a racer or a person at the scene of the incident, consider sharing it through Google's Boston Marathon Explosion Person Finder. If you were there and are safe now, consider letting everyone know by registering yourself on the American Red Cross Safe and Well website. If you're looking for information about a friend or loved one, you can also search both of those sites for their name and status.